I was at the Temporary Space last night and got into a conversation with one of the exhibiting artists, Terry Suprean. We were talking about sports and how sports fans have to become really knowledgeable about their sport--that watching a football game wasn't comprehensible the way a movie was unless you had lots of hard-won prior knowledge. This was as an analogy for contemporary art--that the average person coming into an exhibit of contemporary art might feel perplexed or even intimidated, but with a little knowledge--a class you took, or maybe watching Art:21 on TV, or most likely, experience going to exhibits--you would be like the knowledgeable football fan watching a given game. This lead us into a discussion of fantasy football leagues and fantasy baseball leagues. We wondered if such a thing could be done for art. Now thinking about it, I think it could easily be done for art. You pick a time of year before the big auctions begin. You have a list of auctions (Sotheby's, Christie's, Phillips de Pury, etc.). You have the names of the artists (we'd concentrate on contemporary artists, but I guess you could expand it) whose work sold in the previous year (and all pevious years, I suppose) and their annual total through these various auction houses. Players pick one or more of the artists on this list or, if you are really daring, off the list. The process of picking may be a draft--you draw straws to see who picks first, and then you go round robin until each player has, say, 10 artists on his or her "team." The goal is to have the highest cumulative auction results by the end of year. 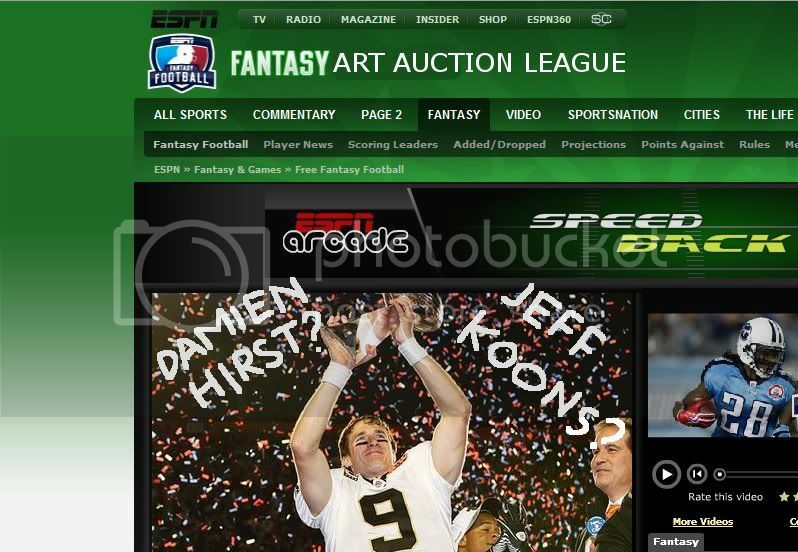 I'd play Fantasy Art Auction League. Anyone interested?